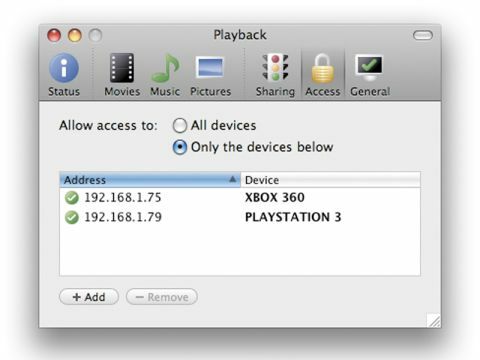 YazSoft Playback for Mac OS X is a UPnP (Universal Plug n Play) server designed specifically for the PlayStation 3 and Xbox 360, both of which have impressive media streaming capabilities, though it supports other UPnP compatible receivers too. There's integration with iTunes, iPhoto, Adobe Lightroom and Aperture, as well as individual folder browsing, all of which proved virtually seamless in our tests. It also sports bandwidth limiting to avoid slowing your network, the use of Spotlight searches and Quick Look previews, an access control list and integration with Growl's notification software. So far, so good, but it's Playback's price and simplicity that really make it stand out. It costs £9.30 for three licenses, which trounces the competition. Nullriver's Connect360 and MediaLink do the same job, but although they don't have any features that trump Playback, they cost a total of £25. Rivet 2.2 shares some features with Playback but costs £12. We had some problems in testing, but this was due to the consoles. While both consoles support most videos, MKV files and protected iTunes content won't work. The PS3 struggled with some HD content but the Xbox managed, despite being on identical network connections. The Xbox also won't play songs purchased from the iTunes Store, despite supporting AAC.